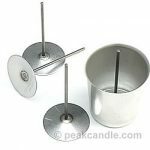 This page contains an assortment of useful tips, tricks, and tools for candle making. Color Formulas: Liquid Dye mixing suggestions. Color Suggestions: Ideas for selecting the perfect color to match your fragrance. Comparing Scent Throw: Is my candle strong enough? 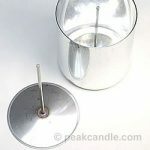 DIY Candle Lid: Here is a great way to make your own cute and inexpensive covers for candles that don’t have lids..
Do It Yourself Wax Melter: For easy bulk wax melting. Handy Calculators: Use these tools to calculate how much wax you’ll need. Metal Tape to Seal Molds: An alternative to mold sealer putty. Pillar Wick Pins: Learn the secret to getting perfectly centered wicks using pillar wick pins. Safe Containers: How do you know if a container is safe for candle making? Votive Wick Pins: Learn the secret to getting perfectly centered wicks using votive wick pins. Water Baths: How to set up a cool water bath. Wick Centering Tools: Keep your wicks straight with these handy tools! Scent Mixing Ideas: Need more scents? here are some scent mixing ideas. Need to know how to get the wax out of the mold after it cools. If the wax has completely cooled and is not coming out of the mold, put the mold in the freezer for about 10-15 minutes to allow the wax to shrink and then it should release from the mold. I made a candle and I always get a depression near the wick on the surface!!! Why does that happen!!! Hi Twinkle, Thanks for your question. You get that depression because wax shrinks as it cools. As it solidifies, it takes up less volume. This volume deficit presents itself as the depression you are seeing in the center of the candle. Some waxes do it less than others. The solution is to plan to do a small re-pour to top it off after the wax has cooled and solidified. Sometimes, you may need to do several re-pours, especially for larger candles. I’m having problems with my two 3″ x 6 1/2″ pillar molds, please help. My problem is that after I pour wax into them, it comes right back out after a few seconds or so. In less than a minute basically. I thought it was the mold sealer was too old, so I got newer. It still happened, figured the wick was to thin, so I got thicker wick. In 1 mold there is still wax at the very bottom of it as well. What do I need to do here. I’ve several different answers. And, I cannot buy new molds at all, and I have a big order need them for. Hi Tisha, that sounds frustrating. It sounds like after you fill the mold with hot wax, it is leaking out thru the wick hole? This can happen if the wax is too hot. Try lowering the temperature that you are pouring your wax at. Try 160 degrees F or 70 degrees C, or even lower if it is still leaking. I am making candles and the base area keeps dropping inside the candle leaving a crater like hole in the middle, any tips to help keep it solid? Hi. Want to make a candle that ‘bleeds’ red when melting. I want to use soy wax. It’s a skull mold that I want the outer ‘shell’ white soy wax and the center be filled red so it seeps blood-like when melting. Can’t figure out how to pour the wax in the center without melting the outer shell. Do you any techniques to doing this process? Thank you. What I would do, Dave, is make the interior how you want it (blood red). Then, once you have made those molded interiors, dip them in un-dyed soy. The opacity of the soy will cover up the color of the interior. Dip it a several time until you get a shell thick enough to your liking. My candles seem to turn out well at the end physically but they soy wax doesn’t seem to hold the scent of my essential oils well. I’ve used higher and higher drops but nothing. Can’t smell them at all after they’re dried and there are air bubbles when pouring. Can I melt wax in the oven? Melting wax in the oven is never a good idea. It is dangerous because if it reaches the flash point, it behaves much like a grease fire. If you just want to melt some wax out of containers, it is best to preheat the oven to about 200F. Then, turn the oven off before placing the containers in the oven. I try to make paraffin wax container candles. Ask burning for a while the melted wax drowns my wick and the fire goes off. and I noticed that only the centre part of the candle gets melted. The wick is either too big, or too small. What is the diameter of your container? What is the melting point of the paraffin? And, very importantly, what kind/size of wick are you using? My homemade candles look perfect, however, they do not burn evenly – any advice would be welcomed. Thank you!